Ok, I think we are finally at the end of my [slight] obsession with the Wellington Testimonial, to use it’s proper name. If you are reading this Conor, then look, I have finally used the official name. Most people, including myself I should add, call this particular structure the Wellington Monument, well I have news for you now my friends, it’s actually called the Wellington Testimonial. The Wellington Testimonial was designed by Robert Smirke as a testimonial to Arthur Wellesley, Duke of Wellington. It was completed in 1861 and is the tallest obelisk in Europe at just over 62 metres tall. I gather it was once the largest obelisk in the world, but alas no longer, that medal belongs to the Washington Monument in, er………………Washington. There are lots of great stories attached to the building of the monument but I think my favourite has to be the poor butler who allegedly managed to get himself sealed up inside the plinth. The story goes he slipped inside with lots of dirty crockery after an al fresco opening party and nobody noticed he was inside when they laid the final few blocks to seal up the entire structure. The poor guy wasn’t noticed missing for a few days. I wonder did he stash any food inside on the sly. To purchase a signed 12 x 9 inch print of this photo, just click the button below. 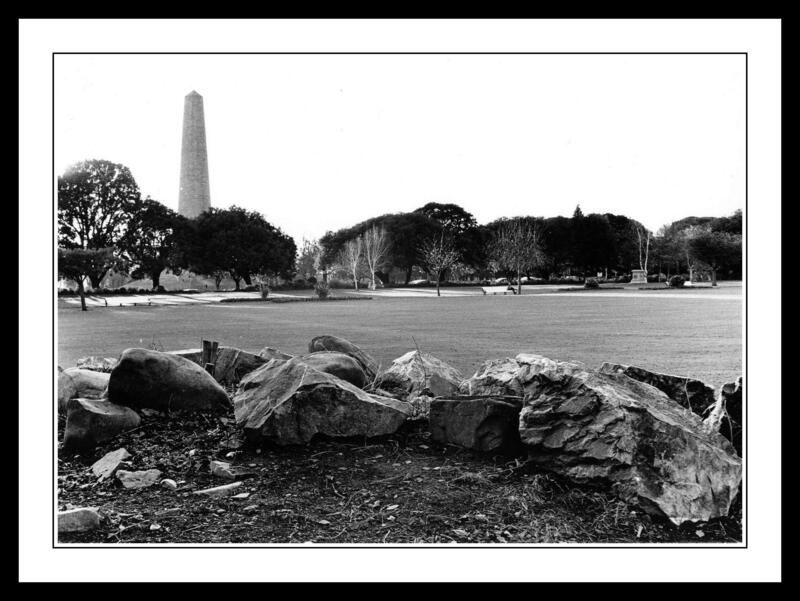 This entry was posted in Black and White Photography, Film Photography, Irish Landscapes, Phoenix Park, Photography and tagged arthur wellesley, Black and White, Black and White Photography, bronica medium format, Film Photography, Medium Format, medium format camera, Phoenix Park, Photography, Wellington Monument. Bookmark the permalink. Interesting historical tidbits about the Wellington Testimonial. How sad for the butler:(. I like the rocks in the foreground of your picture. Nice. I would love to think that the butler story is true but some people question it, kind of funny though. Thanks again for your encouraging comments. That’s a new one to me Phil. Thanks for that, I’ll be using that name from now on.